Hey, it’s Gergo from the Ustream Product team! Today, I am thrilled to announce the major update for our Ustream app on Android, which now brings the full power of the Ustream experience to Android tablets and mobile phones. 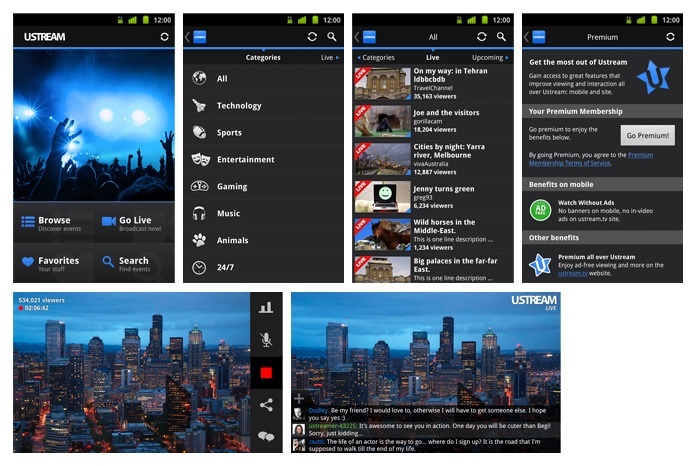 The new Ustream app, supported on Android 2.1 and newer, boasts a whole set of tablet optimizations in addition to several important mobile updates. Let me guide you through the top highlights. Discover live, upcoming, and recent events, or explore by category. Go live and interact with your audience by issuing a poll or chatting. Access shows from your Ustream Crowds and events that you’re attending. Watch featured shows of recommended Ustreamers. Navigate through brand new screens with spiffy dark design theme. Move the app to SD card to free up storage space. Watch even more shows and videos on mobile with new, enhanced format handling. Use the app on even more supported devices, now including Nexus S.
We’d love to hear from you! We are inspired by our users’ valuable feedback. Go ahead, drop us a note at feedback@ustream.tv. Also, we’re working on other exciting features to give you the best personalized Ustream experience, anytime, anywhere. Stay tuned for more updates! Gergo is responsible for the Android products at Ustream. He works in tight cooperation with the Android developer team, the designers, product architects, sales and marketing. He defines strategies, approves designs and specifications, prioritizes development tasks, reviews implemented features and schedules their release. You can follow @GergoRad on Twitter.